At a time where so much of my professional decisions seemed to be at the diktat of a higher authority, this tweet was a rousing call to arms and a timely reminder that professional judgement ought to trump external pressures. It suggested valuing personal judgement valued over exam percentages, valuing real teaching over the misuse and inconstancies of Ofsted teacher guidelines, perhaps even valuing principles over Principals. It wasn’t so long after this that the new GCSEs were announced and a new National Curriculum curriculum was being penned. During this time, my mind often drifted back to this tweet, applying its principles to other aspects of work at school, particularly when the task of redesigning our KS3 curriculum came about. Would the following words have been just as powerful? I suspect many teachers, perhaps wisely, would disagree with the idea that a KS3 curriculum should be designed without paying any heed to external factors. Traditionally, I expect, the primary goal of the KS3 has been to prepare students for KS4. Indeed, in a recent discussion on Twitter, it appeared there might be a growing trend in starting KS4 a year early, or even virtually dispensing with KS3 altogether. Whilst I understand why these decisions are made, I think there are serious potential problems with such an approach. Problems which, even in my short career, have led me to make fairly poor choices for my students. When I started my teaching career, English Language was what counted for a schools performance measures. You could even get kids their treasured ‘C’ by guiding them through a single ‘English’ GCSE, eschewing English Literature completely. English Literature, whilst taught to the ‘higher ability’, was simply not as important. Our KS3 curriculum reflected this. We knew that GCSE Language was heavily weighted towards non-fiction writing, so KS3 ‘writing triplet’ schemes were abundant. We knew that analysis of images, front covers, and non-fiction adverts were a focus, so I seemed to spend much of my day exploring colours and fonts on superficial adverts and leaflets. We also knew that students, particularly those pursuing the single English course, would not need to read particularly complex Literature, so our KS3 readers were almost entirely teen-fiction, picked solely to entertain and engage our KS3 kids. 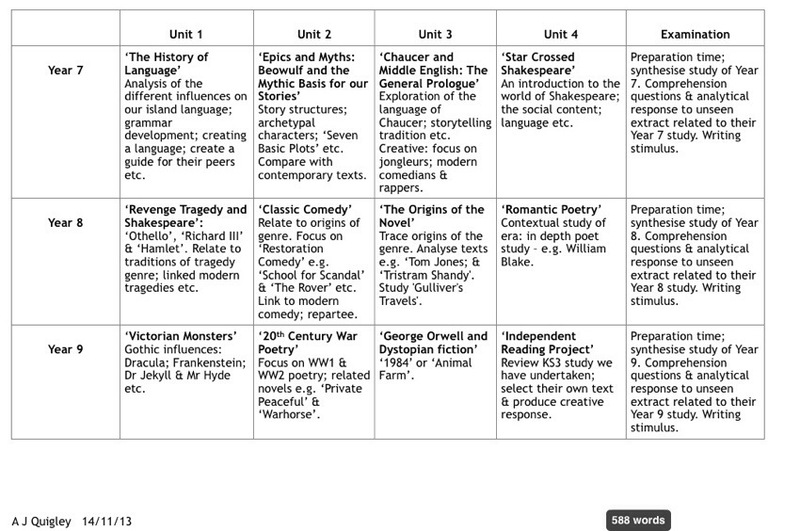 My KS3 choices were primarily based on the KS4 exams, and I think my choices were fairly poor. I don’t think focussing on writing triplets necessarily leads to good writing. I don’t think analysis of superficial texts helps students analyse. And I don’t think we should select KS3 texts primarily based on second guessing our student’s interests. No, I think when designing a KS3 curriculum we should return to our principles, and what we know is so special and so brilliant about English, and do that anyway. For me, this includes appreciation of the a range of great English Literature, a breadth of experience including great poetry, great drama and great pose and helping our students develop into confident, creative, and fluent writers. In my department, we have discussed the following core beliefs: That in order to develop students as readers; a range of mostly teen fiction will not suffice. That developing great writers must involve exposure to great writing. And, that to develop our student’s analysis, world knowledge and vocabulary knowledge must be addressed, through high quality texts, not simple adverts. There’s also this excellent example from Dan Brinton’s blog here: Again, I’d be delighted to teach this curriculum. The level of challenge is exciting. The range of poetry, prose and Drama looks incredible. Mostly, I’d be excited about the opportunity for depth of study afforded by moving away from the traditional ‘a topic a term’ model which I had previously thought as the norm. There are also several other great blogs which have helped my department plan: One Scientific Insight for Curriculum Design from Joe Kirby, Principled Curriculum design from David Didau and Redesigning the KS3 Curriculum from Rebecca Foster. What I like about these posts, alongside the two already mentioned, is another set of principles being brought to the forefront of Curriculum design, more scientific principles such as,spacing practise, quizzing for retrieval, sequencing content and defining threshold concepts. All provide food for thought and reflection when piecing together the ins and outs of a KS3 Curriculum. So, with all this in mind, what are we planning on doing next year? 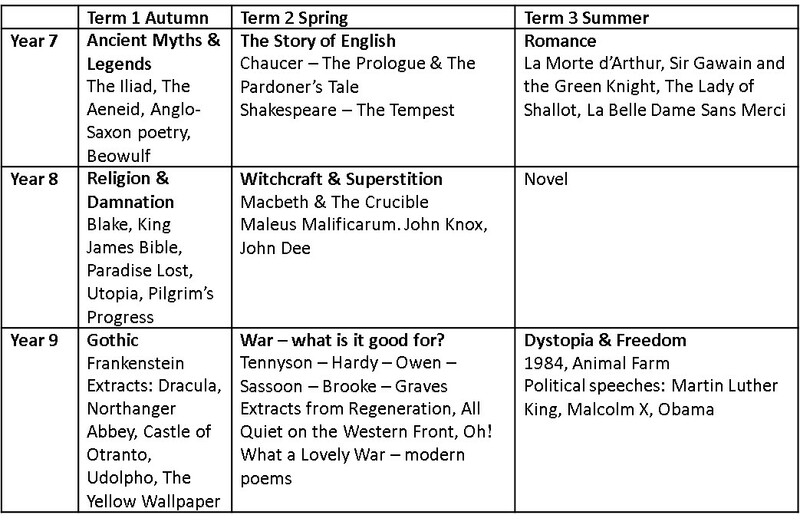 I’d like to finish with sharing my department’s KS3 plan. It’s by no means perfect, likely to be tinkered with over the coming months, and certainly open to criticism. But I’m really excited to teach it, and I’m happy with our principles. 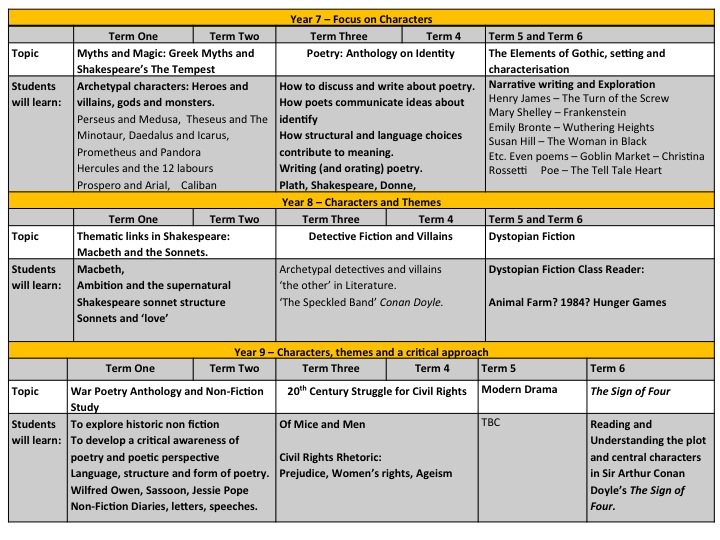 In my next post, I’ll be unpicking this curriculum in more depth, exploring how we are designing our KS3 Schemes of Work. ← How do you teach a novel you’ve never taught before?